I love a good planning session and there’s nothing quite like the start of school (let the mamas rejoice!) and a new month to really get me pumped to plan ahead! First, let’s take a quick look at how loosey-goosey my planning became towards the end of summer. We had a constant stream of visitors and I put my writing on the back burner so I could be fully present with my kiddos. This meant that while there were things I didn’t want to miss or lose track of, I didn’t need as structured a setup in July and August. I pared it down to what I felt I needed, used even less than that and we all survived just fine! 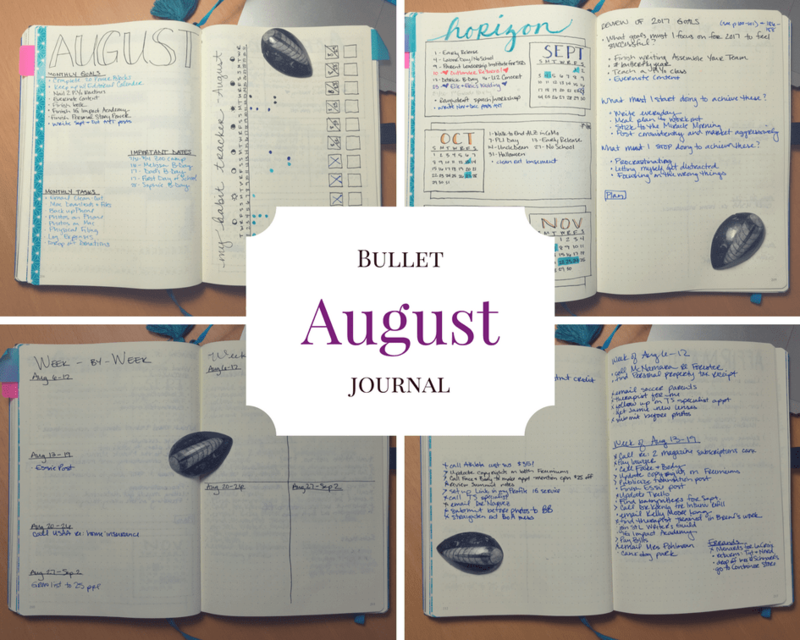 This is the beauty of the Bullet Journal system developed by Ryder Carroll. It’s infinitely flexible, so August was minimal, but now September is way more detailed and robust. 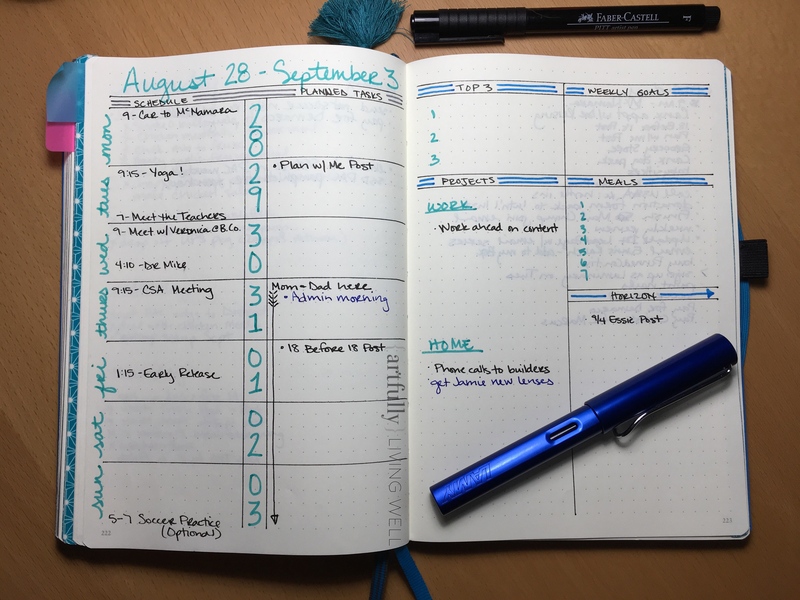 I hated all the unused pages in traditional, pre-dated planners…with a Bullet Journal you don’t have to worry about it at all! New to Bullet Journaling? Check out my post explaining the system here! Only for this last week of August did I set up a more formal weekly spread (shown below under Sept) because the kids are in school and I’m back in work from home mom-mode! My weekly spread is based largely on ones shared by Kara over at BohoBerry. 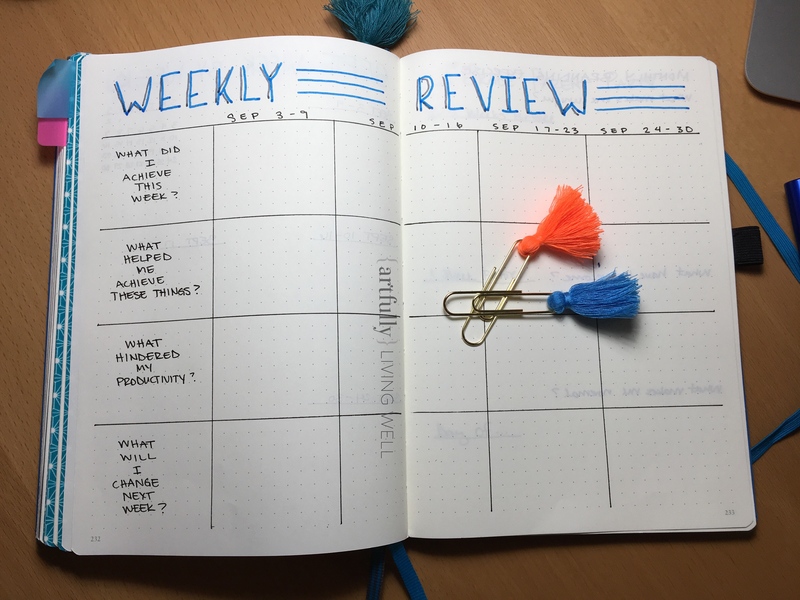 If you’re wanting to learn more about setting up a bullet journal, she’s a great resource, both on her own website and her YouTube channel. For September I kept my normal monthly spread. I like to list out the larger goals I want to achieve for the month, document the tasks which only need to be done monthly and make note of any key dates coming up, like weddings or the U2 concert we’re going to see. Then I have my habit tracker where I log how I’m doing on behaviors I’m trying to change, like “No Mindless Games” on my phone or iPad. Does anyone else get super sucked into those darn things? I always think I’ve only played for 5 minutes and then I look up and I’ve wasted way more than that! Anyway, I digress. The one thing I always keep somewhere in my set-up is the Power Block challenge and lately, it has fit nicely under my habit tracker. 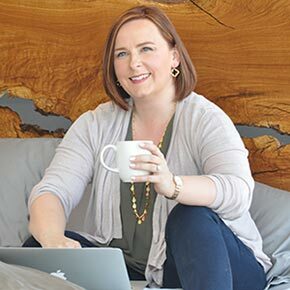 I started doing this challenge this back in March when the amazing Lisa Jacobs of Marketing Creativity asked her followers to attempt completing 20 Power Blocks (90 minutes of uninterrupted, focused work) in a month. I was amazed at what I could accomplish in just twenty 90-minute chunks of time and it was so motivating! 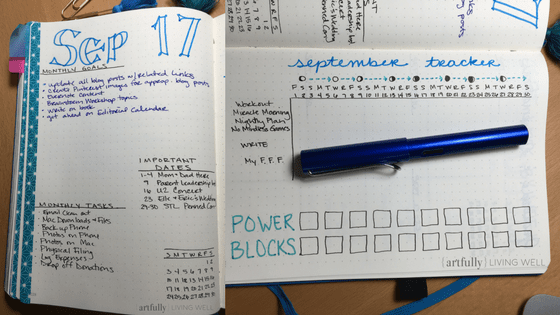 From that month on, I’ve kept some sort of Power Block goal in my monthly planning, flexing the number down a bit over the kid-centric summer months. Next up is my Gratitude log and where I will record a few affirmations to focus on for the month. After that, I have my week-by-week planner and a 2-page weekly review spread. I’ve shamelessly borrowed both of these from Lisa Jacobs, as well. I take a look at the big goals for the month and what I need to have done by the end and back out weekly goals and tasks accordingly. Then at the end of the week, I take a look back and see what was working for and against me and nail down at least one thing I can change during the next week. After these spreads then I’ll just jump right into my weekly and then daily pages. I don’t do anything fancy for the daily spread. For me, this isn’t about giving myself a creative outlet – it’s about getting stuff DONE. So on any given day, I’ve grabbed 4 different scribble-sticks (even a crayon once) to get my tasks down on paper quickly and then move on with knocking them off the list. That’s it, friends! 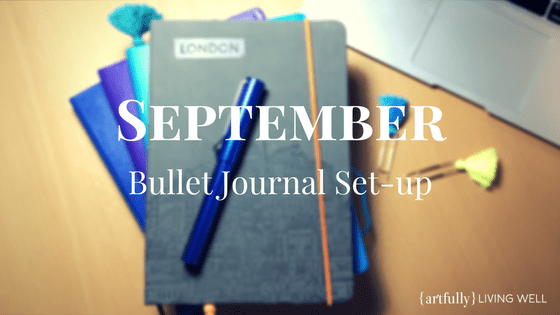 I hope you enjoyed the peek into my Bullet Journal and how I’ve got September set up. Next month I’ll be moving into my new Leutchtturm 1917 notebook, so I’ll go into more details about how to transition from one journal to the next! This will be my 5th notebook with this system and I’m so glad I stumbled on it 2.5 years ago!